The mens’ competition on Sunday the 8th of April was an 18 hole Strokeplay kindly sponsored by Ireland’s leading golf shop, Golfstyle, which is located in the Liosban Business Park, Tuam Road, Galway. Gerry O’Hara was the runaway winner with a 62 nett, beating fellow Ballinafad man Peter Leydon into second place with a 68 nett. 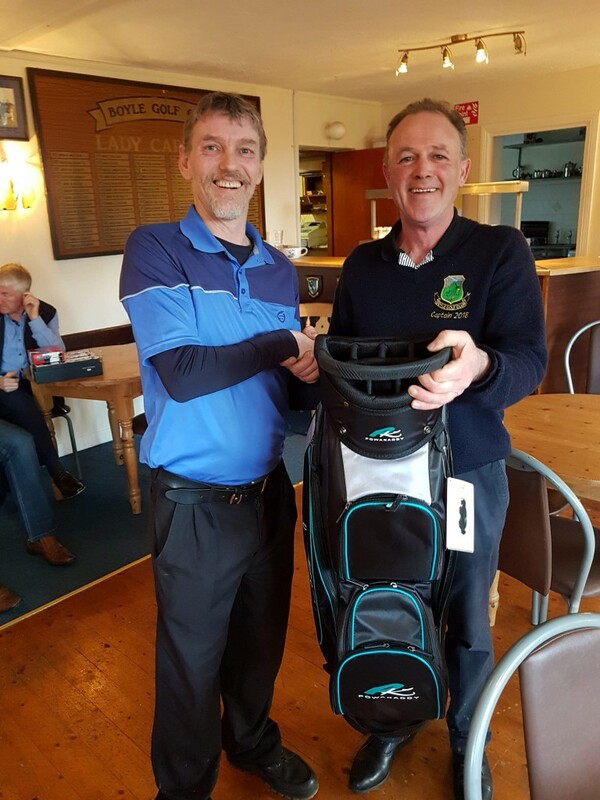 The picture above shows Gerry receiving his prize from captain, Terry Canning.Charlie O’Donnell took the prize for best gross score and Frank Casserly was third with 69 nett. The Easter weekend Shambles fundraiser was won by the team of Paul Connolly, Patrick Egan, Conor Hamill and Moira Egan with 117 points.Second place went to Ted Hester, Frank Casserley, Lewis Shaw and Jim Callery with 112 points, and the Ladies Prize went to the team of Mary O’Hara, Joey Mullaney, Carmel Mc Garry and Carmel Conlon with 96 points. The first of the mens’ weekly Thursday night competitions took place on the 5th of April. The winner’s bottle of brandy found a home in Deerpark with Charlie O’Donnell in what has been a productive week for him. Upcoming competitions – Sunday the 15th sees the second of the new initiative of sponsored Sunday competitions for the men, this one being kindly funded by Keating Amenity Solutions. A ladies’ 18 hole stableford competition takes place the same day.The PGA Tankard competitions take place the following Sunday, the 22nd of April. In the second of this years inter-club competitions, the mens’ club are hosting Ballinamore in the first round of the All-Ireland Fourball Competition on Saturday the 21st. The course will be closed for a few days from this Tuesday while verti-draining takes place on all the greens and on some areas of cattle damage. The club wishes our member Lewis Shaw all the best in his year as captain of the Shepherd’s Crook Golf Society Charlie O’Donnell took the prize for best gross score and Frank Casserly was third with 69 nett. The Easter weekend Shambles fundraiser was won by the team of Paul Connolly, Patrick Egan, Conor Hamill and Moira Egan with 117 points.Second place went to Ted Hester, Frank Casserley, Lewis Shaw and Jim Callery with 112 points, and the Ladies Prize went to the team of Mary O’Hara, Joey Mullaney, Carmel Mc Garry and Carmel Conlon with 96 points. Today’s 9 hole stableford was won by David Wynne with 23pts, in second was Dave Purser with 22pts (C/B), while in third was Vincent Egan also with 22pts. In upcoming fixtures, the annual Christmas Scramble will be held on Tuesday 27th December. The draw is at 12.45pm with a shotgun start at 1pm. On behalf of Boyle Golf Club, I would like to wish all members and friends of the club a very happy Christmas and best wishes for 2017. The Christmas bonanza was held on Sunday with a large number of members participating. Forty points was the mark required for the gents to feature in the top three. First prize went to Paul Connolly (18) 40pts, on a countback from John McGuinn (9) 40pts & Lionel Lynn (20) 40pts. The gross prize went to Lorcan Egan. In the ladies section, first place went to Sandra McCrann, in second was Regina McLoughlin & in third was Mary O’Hara. The club’s monthly draws also took place on Sunday for October-December. The winners were John & Claire Cryan, Seamus & Marie Gallagher & Denis & Mary O’Donnell. The runners up were Liam Mullaney, Denis & Mary O’Donnell (again! ), Michael Gilmartin, Padraig O’Connell, Gerry Carty & Jonathan Egan. Thanks to all who entered these draws. Next Sunday there will be a nine hole re-entry for gents. The final turkey voucher of the year took place last Sunday with the standard of scoring remaining high. In first place was Gerry O’Hara (20) with 24pts, in second was Liam Whyte (13) 23pts, while Paul Connolly (18) took third on a countback with 22pts. Last week’s Winter Open competition was won by Liam Mullaney (15) with 22pts. This upcoming Sunday 11th December the club’s most significant winter competition, the ‘Christmas Bonanza’ will take place. The format is an 18 hole stableford for ladies and gents with a prize for all players that take part. The timesheet for the competition is now live with tee times available between 8.50am and 12.30pm in 10 minute intervals. Members are advised to book early to ensure their preferred tee time. It will be followed that evening by the presentation which will take place at 5pm. The weekly winter open 9 hole competition also continues again this week. The monthly meetings of the men’s and ladies’ clubs will take place on Wednesday evening in the clubhouse at 8.30pm. The management committee meeting will be held directly afterwards. Last Sunday’s Christmas Scramble was postponed due to a waterlogged course. It has been provisionally rescheduled for New Year’s Day if the conditions allow. The times remain the same: draw at 12.30pm & tee off 1pm. The levels of precipitation experienced during the past month has made it very difficult to fulfil all competitions on the fixture calendar. However, it is hoped that a regular schedule will be resumed in early January. This includes a nine hole stableford set to be held next Sunday, January 3rd. Finally, may all members, visitors & friends of the club have a happy and peaceful new year. The Christmas Bonanza was held today with approximately 40 players competing. This year’s President’s Prize winner Martin Wynne claimed the top prize in the men’s category with an excellent score of 42 points. He was closely followed by 2016 Captain Ross Andrew with 41 points. Gross was won by John McGuinn with 29 gross points off a nine handicap, while David Wynne finished in 3rd position with 40 points. In the ladies section, the newly instated Lady Captain Tish Perry took top honours. Liz Dwyer was runner up and Susan O’Mahoney rounded off the top three. Photos are available to view on Flickr. Click here for link or icon on header and select the relevant album. Next Sunday December 27th the traditional Christmas Scramble will take place. The draw will be made at 12.30pm and commence with a shotgun start at 1pm. 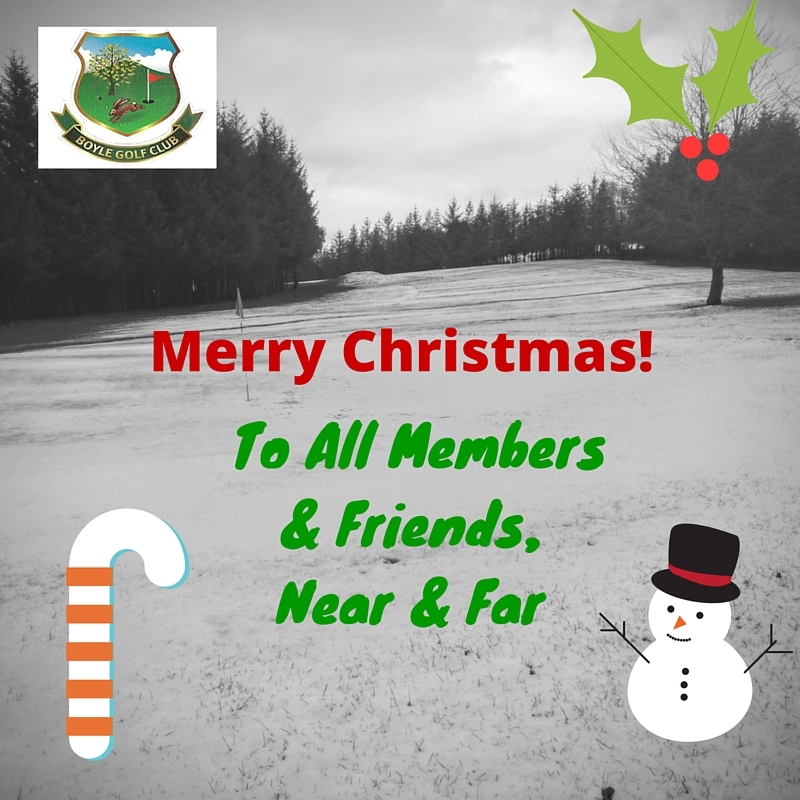 Finally, we would like to wish all members and friends of the club a Merry Christmas & a Very Happy New Year with much success both on and off the course in 2016. The Christmas Bonanza which was scheduled to be held today was postponed due to inclement conditions. It will now take place this upcoming Sunday, December 20th weather permitting. Tee times can be booked on the BRS online system through the club’s website. The weekly Winter Open 9 Hole will also take place this week subject to golf course conditions. Gift vouchers are available to purchase and would make an ideal Christmas gift. They can be used for bar/ catering facilities as well as contributing to membership fees. Regarding the latter, very keen rates exist for beginner players wishing to take up the game. Email Michael at Info@boylegolfclub.com for more details. The Christmas Bonanza scheduled for this Sunday has been postponed. The course will remain closed for the rest of the week and won’t reopen until Monday at the earliest.